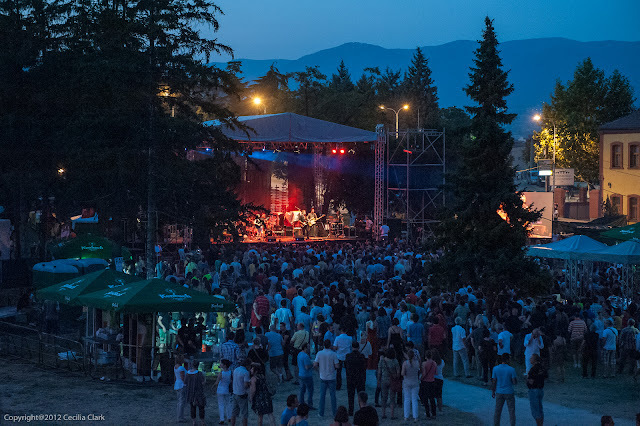 Mini skirts and hot pants of the 70s are once again popular so it was only a matter of time before performers from the 80s re-emerged to perform in Skopje. Duran Duran is quite popular in Macedonia. 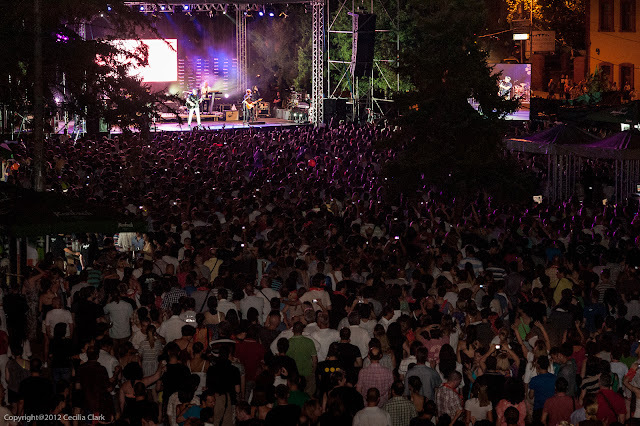 This young Macedonian crowd knew Duran Duran and all the words to their songs. Even though tickets were 1000 MKD (about $20) there was a large crowd. Fan-pit tickets cost 1500 MKD and from our vantage point, the pit was packed like a jar of pickles. The venue was the main reason we wanted to attend. The fortress has been closed since we arrived. Unfortunately, it is still closed. 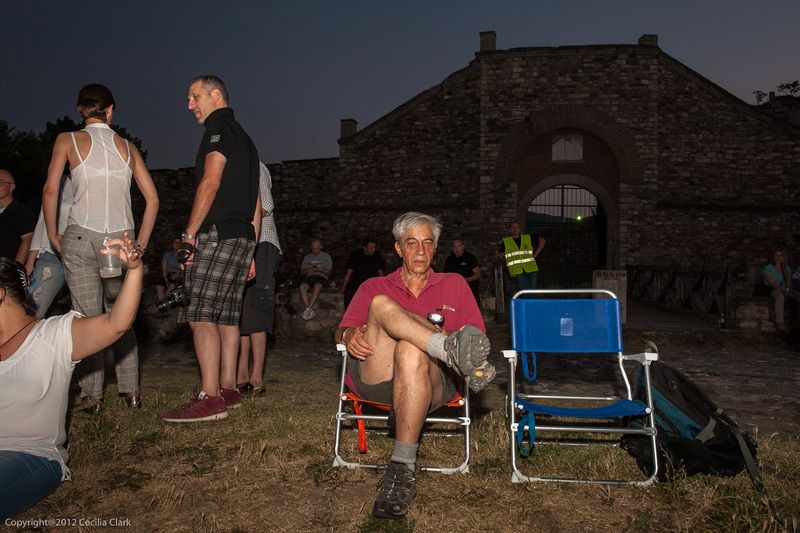 The concert was not inside the fortress but on the lawn outside the fortress walls. After having our plastic bottles of ice water taken from us at the entrance, Dan was drawn toward a "cigarette" sign like a flying bug to a light. 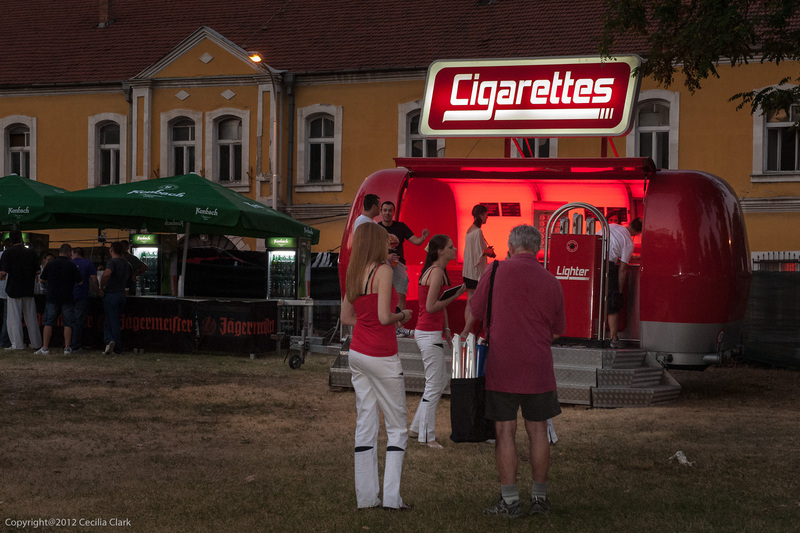 The cigarette kiosk had some kind of a promotional game event on an iPad with a prize. Dan played the game trying to keep a motorcycle from crashing on a race course. The rider died many times but Dan still won a lighter. We brought chairs to this event and positioned them at the crest of a hill so we could see down into the stage and still enjoy the breeze which was ever so slight. We didn't see any other chairs anywhere. The above photo is of the concert ground and surrounding scenery while the warm-up group performed. The below image is of the much larger crowd during Duran Duran's performance. All those little spots of light in the crowd are cell phones recording the concert. The last time I was at a rock concert, there were no cell phones. Dan has a colleague from ABA in Washington DC visiting. She is 20-something. When Dan told here we saw Duran Duran on Saturday, she said, "I thought they were dead by now." This week I have been hibernating during the day, and like most of the residents of Skopje, I emerge from my apartment cave after the sun sets. With Dan's colleague, we have been going out to dinner each evening and then on to the Skopje Summer 2012 entertainment. If the performance is an outside venue, it is great. 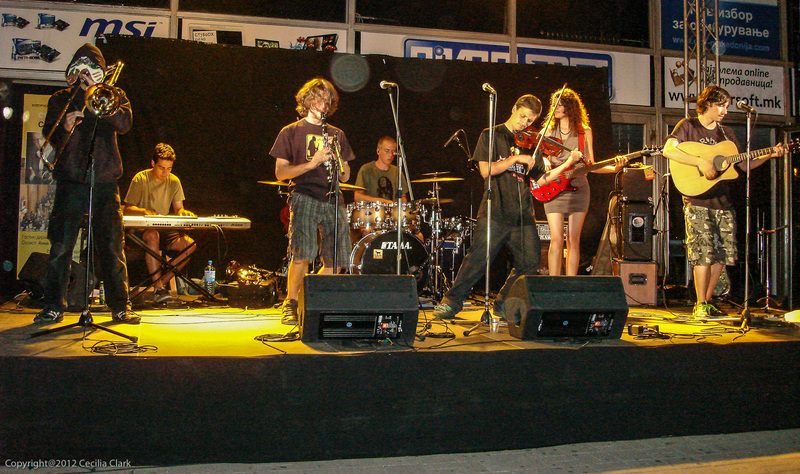 Monday night we saw an energetic group from Hungary called Fabula Rasa. Their music was a fun blend of Hungarian folk music and heavy metal. They played guitars, clarinet, saxophone, drums, keyboard, violin, and trombone. Sunday and Tuesday evenings the performances were inside museums. All museums, public spaces, restaurants, and most private spaces lack air conditioning meaning at these performances a lot of body fluids flow. 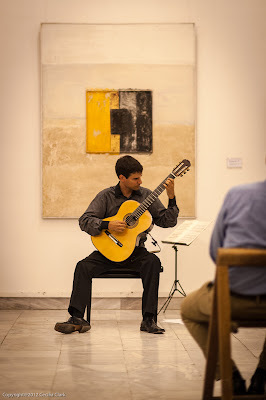 Last night's performer was guitarist András Csáki from Hungary. He played lovely classical guitar, but the venue Daut Pashin Aman, a 15th century Ottoman hammam that is now a museum, was sweltering inside. There was one small fan/ventilator on a stand, but the woman seated next to me turned and stared death rays at the fan operator so he turned the face of the fan/ventilator up into the 30 foot ceiling. No breeze, no more. Yesterday, the power went off at Dan's office. Dan's colleague, Ellen, is staying in a small hotel on the floor below the ABA office. That meant that she also lost power to her room air conditioner. Her hotel room has one window but the window does not open. After about 45 minutes, power was restored. It was 104F (40C) yesterday.